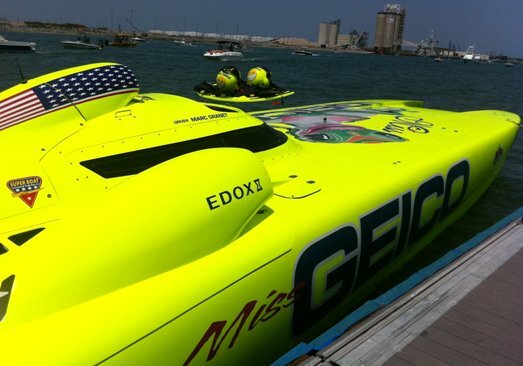 Miss Geico is legendary in the world of offshore powerboat racing. The extreme class boat is powered by twin Lycoming T-55 gas turbine engines and can reach speeds in excess of 210 miles per hour. Driven by Marc Granet and throttled by Scott Begovich, Miss Geico has captured five consecutive World Championships in 2006, 2007, 2008, 2009 and 2010. It’s not surprising that Edox would want to be associated with the legendary Miss Geico racing team. Edox was the first watchmaker to make a substantial commitment to motorized water sports. Working in close collaboration with Class-1 powerboat engineers, Edox developed a special timing system that utilizes both satellite and GPS technology to provide a level of accuracy that was previously unheard of in powerboat racing. The water-resistant, shockproof system has been tested in open seas at speeds of over 160 mph. As a result of their timekeeping research, Edox is now the official timekeeper for the Class-1 World Powerboat Championships. 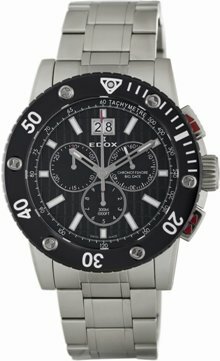 Edox is already the official timekeeper of the FIA World Rally Championship and this new partnership solidifies their reputation for technical excellence and reliability serving major international sporting events. The relationship between Edox and the Miss Geico racing team is already off to a rousing start at the June 19 season opener of the AMSOIL Offshore Powerboat Series at Sunny Isles Beach, near Miami. The 1,860-horsepower Miss Geico was neck and neck with the 1,450 horsepower Cintron boat for most of the race, but the Miss Geico team pulled out all the stops during the final laps to take the checkered flag. This friendly rivalry between two super fast teams will likely continue in future challenges, but for now Miss Geico is clearly the team to beat. With a win in the season opener, the Edox sponsorship is clearly a win for Edox and it’s marketing partner The Gevril Group, and this unique marriage of technology, precision and speed has benefits for both Edox and Miss Geico. The relationship could also be a big win for you when you play the new Powerboat Game on the Edox website. Winners with the highest score will receive a fabulous new Edox Class-1 Chronoffshore Big Date watch.